Kirkco understands the importance of precision when processing multi-component materials. Different systems are required for different materials. There are three mixing systems available to process variances in viscosity, mixture properties, short pot life, etc. 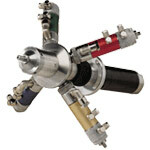 The static mixer consists of a twin-dispensing valve with a "snuff back" effect and a plastic mixer tube. The valve is activated pneumatically or electrically. The static mixer operates without flushing agents because the components are routed separately until they enter the mixing tube. Difficult to mix materials use Static-Dynamic Mixers. 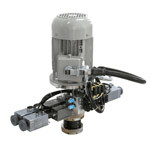 The static-dynamic mixer is a combination of dispensing valve and motor. The motor rotates the mixer element in the plastic tube. The drive is either pneumatic or electric. Static-dynamic mixers run without flushing agents because the components are supplied to the mixer tube intake separately. Dynamic mixers can mix materials with an extremely short pot life, widely differing viscosities and mixing ratios. The mixing rotor in the central chamber mixes the components evenly within a very short time. The mixer head can be operated either cooled or heated. The mixer motor drives are either pneumatic or electric.